My foster mom obviously thinks highly of me. She said I have wonderful house manners and can be trusted to be left alone and free while she’s away. She says my good manners extend to car and boat rides! If you like to walk, you’d LOVE to walk with me! People have observed that my walking skills are extraordinary! I walk with a loose leash and in the heel position; I do not pull or jump. I take two one-mile walks each day, despite having some hip problems. I can even climb into an average-size SUV! I do take medication for my hips, but happily, the nice vet has lowered my dosage a bit. Likely the walks and staying slim have helped me. I love people of all ages! The neighborhood kids are so special. My foster mom says I am “adorable” with them. But, other animals, not so much. Interacting with them makes me tense. This is where a new practice, taught to me recently by my foster mom, comes in. If we meet a dog on a walk, I sit to the side and look at only my mom. Meeting other animals is a bit easier now, but I still don’t actually want to live with them. Besides a loving human family to live with, I also must have my favorite moose toy. 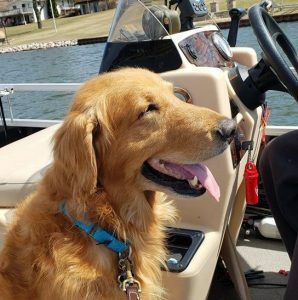 He goes on walks with me, takes naps with me, and even goes on the boat! I’m considered a quiet boy, who enjoys snuggling and appreciates being loved. Do you think my toy moose and I could find a nice cuddle spot in your home?